To better understand this emerging paradigm, it will help if we come at it from two different angles—a deep exploration into direct subjective experience, and an exploration of the most essential qualities of living organisms and living systems. Positivistically oriented thinkers generally discredit research methodologies that have been established from within other epistemologies, and especially those such as mindfulness meditation, a form of subjective inquiry that was established thousands of years ago in an entirely different culture to that which exists in industrialized society today. In spite of this, the limits of positivistic inquiry are becoming increasingly recognized, especially with regard to studying subjective experience. One particular branch of research methodology known generally as qualitative research has emerged as a response to these recognized limitations. As the name suggests, qualitative research emphasizes quality rather than quantity, and process rather than matter, emphases which are essentially opposite to those of positivistic inquiry. One kind of qualitative research is known as phenomenological research, which essentially refers to the exploration of direct present experience. And it turns out that mindfulness meditation (known as vipassana in its original Pali language) is an extraordinarily well structured form of phenomenological inquiry dating back over 2,500 years (being discovered by Siddhartha Gautama, who became known as the Buddha as a result of this discovery and the dramatic impact that it apparently had on him). Mindfulness meditation is becoming increasingly appreciated and well respected in the West, not only for its therapeutic effects but also for its means as a very powerful method of phenomenological inquiry. For those unfamiliar with mindfulness meditation, it’s extremely simple but far from easy—you develop the capacity to maintain your attention on direct present experience (raw sensory experience taken in through the five somatic senses and what is often referred to as the sixth sense, the contents of the mind—images, memories, thoughts, etc.). This is all you do—remain with direct present experience in as consistent a manner as you can, while also trying to cultivate a general acceptance, or equanimity, with regard to this experience. And since there are different aspects of present experience (the six senses mentioned above), you can choose to focus on one or all of these sensory modalities. Then, you simply witness the passing show and ride the process of organic unfolding into ever deeper layers of subjective experience. What’s particularly interesting about this form of inquiry is the incredible robustness of the findings that have emerged from it. Millions of people over thousands of years have arrived at the conclusion that there are essentially only three primordial qualities lying at the very core of our experience: nonduality or fundamental interconnectedness (anatta in Pali), impermanence (annicca), and suffering/discontentment (dukkha). And overlying these most primordial of experiences are one’s set of cognitive constructs—the interpretations and evaluations we make of a particular raw sensory experience—and the feelings and impulses that in turn arise in response to these interpretations and evaluations (the word cognitive comes from the Latin word cognoscere, meaning “to know” or “to recognize”). I find it very interesting that the most recent findings within the so called Western fields of inquiry are in direct accord with this understanding of these fundamental qualities, which was established literally thousands of years ago in the East. I’ll go ahead and say a little more about these three core qualities of experience, the constructs which develop on top of them, and how all of these contribute to the most fundamental forces that drive us. This is similar to the illusion of perceiving a wave as separate from the sea, or perceiving a vortex in a draining bathtub as somehow separate from the water flowing down the drain. Matter and energy are continuously flowing through all organisms—a continuous flow of intake and output—and it is only a particular pattern of relationships that remains somewhat steady, and even this pattern is more or less in a constant flux and flow. We can say that the positivistic worldview, generally speaking, is this illusion taken to extremes—an attempt to reify this illusion of a world composed of relatively isolated, permanent and distinct parts into a fundamental truth. But in spite of the fact that the particular types of Western science that we hold with such high regard have concluded that this worldview actually has no solid foundation, most of us have a very difficult time perceiving the world in any other way. Again, the very existence of the “self” depends upon maintaining this self/other dichotomy. We find that we struggle with this same illusory dichotomy in various ways, such as trying to make distinctions between the brain and the mind, or between the organ within our head (calling this brain) and the rest of our body (in spite of significant evidence that this brain/body split is yet another false dichotomy—see Candace Pert’s work). We also tend to dichotomize different orders of “self.” For example, it’s well established that all multicellular organisms (including humans, of course) are essentially a complex organization of individual single-celled organisms (i.e., many small “selves”) living symbiotically with each other, resulting in a higher-order experience of “self.” In other words, the larger, higher-order organism experiences itself as a single “self” in spite of the fact that it’s actually composed of a community of many smaller organisms living in symbiotic relationship with each other. And these multicellular organisms in turn live symbiotically with other organisms (both unicellular and multicellular), resulting yet again in an even higher-order experience of “self” (e.g., a family, a society, an ecosystem, and even the entire biosphere). The third fundamental quality of experience is the more or less universal dance between joy and suffering that goes hand in hand with the inevitable vicissitudes of life. In some ways, this is the simplest of these three fundamental qualities to grasp. If a living organism were to maintain a sense of complete contentment, it would never feel inspired to do anything including meeting its own basic needs, and therefore would likely not continue to exist. On the other hand, if an organism experienced only suffering, then life would become intolerable, and again we find a situation in which the organism would likely not continue to exist. So we can say that this movement between joy and suffering is an essential quality of all living organisms—that which drives one towards continued existence and health. The more we experience our needs as being met, the more we generally experience joy or contentment, and the more we experience our needs as not being met, the more we generally experience suffering or discontentment. Most people who seriously contemplate the three fundamental qualities of experience mentioned above will most likely find it difficult to disagree with them. However, as already discussed, living organisms apparently need to distinguish “self” from “other,” and one “other” from another, in order to meet their needs and to maintain their existence. This capacity for discrimination is done using one’s cognitive constructs — a basic framework for assessing one’s environment and making sense of oneself and the world. Each person’s (and indeed each living organism’s) cognitive constructs are unique, being based upon a blend of their innate structure or temperament (what we generally think of as the hereditary component) and environmental conditioning (which, for humans at least, will likely have significant overlap with other members of one’s society, and even more overlap with other members of one’s family, but will still be unique in many ways to each individual). We can think of our set of cognitive constructs like a tall building composed of a hierarchy of levels, with each level being built directly upon the level(s) beneath it. And the very first levels are based upon the most core assessments we make of our experience, especially with regard to our existence. At these levels, because these are based directly upon the most fundamental qualities described above that we all share, it’s likely that the assessments we make here are very similar for all of us, and therefore they result in a couple of profound existential dilemmas and corresponding drives that we also all share. On what we could say is the first level of assessment of our situation is the recognition that the very existence of our “self” is resting on a very precarious foundation—a dynamic and interconnected flow in which there really is no real solid and secure “self” at all. At this deepest level, then, exists what we could call a profound dilemma that represents the origin of all of our suffering and discontentment. “We” arise from a unified field in which there are ultimately no separate “selves,” the subjective experience of which naturally consists of unitive feelings such as unconditional love, compassion, sympathetic joy and deep peace and equanimity. However, the experience of this unified field comprising the very fabric of the “self” also consists of the profound terror of self annihilation—no “self” can really exist within these no-self conditions. So our existence at this most fundamental level entails a profound and painful dilemma. On one hand, we experience a powerful longing for our continued existence and the general experience of aliveness, but this carries with it a profound sense of insecurity and vulnerability. So on the other hand, we find ourselves also longing for a deep peace and security that are ultimately never entirely possible as long as we exist. So in order to maintain a tolerable and hopefully enjoyable existence, we have to find some dialectical balance between the experience of existence and the experience of transcending one’s existence, between duality and unity. I suspect that it is this most fundamental of our dialectical dances that lies at the source of our most deeply held liberating or spiritual experiences and aspirations, as well as our most deeply held fears and insecurities. Going up to the second level of our cognitive constructs “skyscraper,” we are now more fully immersed in the experience of duality—we experience a “self” as relatively distinct from “other.” Explorations within the fields of object relations, attachment theory, and existential psychology (and my own personal exploration in my doctoral dissertation and in my book, Rethinking Madness) have discussed in different ways the dilemma that occurs at this level. In essence, we find ourselves torn between a powerful longing for autonomy and agency of the “self” on one hand, and a powerful longing for love, belonging and acceptance from “other.” As we strive for autonomy, we find that we encounter increasing isolation anxiety, which compels us to strive in the opposite direction, towards connection with “other.” But as we move in this direction, we find that we encounter increasing engulfment anxiety, which compels us to once again strive for autonomy. So here again on this second level, we find yet another dialectical struggle—one that is in many ways similar to the dialectic taking place on the unity/duality level, but this dialectic has resulted from the emergence of a higher order level of complexity, and so the dialectic also becomes more complex and nuanced. Ultimately, more layers develop on top of these, which consist of increasingly complex and nuanced interpretations of the world and their associated dialectics, fears, longings, feelings, and needs. The further we work our way up this towering skyscraper of cognitive constructs, the more each level becomes susceptible to the influence of the particular organism’s innate structure (temperament), and the more each level becomes shaped by idiosyncratic experience. The result is that while different organisms experience some overlap between their general experience and understanding of the world to differing degrees, every organism will develop a set of cognitive constructs that is unique. This is similar to the way that we can say that no two snowflakes are exactly the same in spite of their sharing many of the same basic patterns with other snowflakes. So, now that we’ve explored what it feels like to be alive from the “inside,” let’s explore the process of life by taking a somewhat more objective approach. What exactly is a living organism, and are there properties or qualities that we can say are common to all living organisms? However, as already alluded to, recent findings within the life sciences and new understandings emerging from complexity and systems theories have been forcing us to consider a very different understanding of living organisms and living systems and a very different set of properties belonging to them. Contrary to the general positivistic paradigm, we find that living beings simply are not machines nor are they anything like them, existing under an entirely different set of principles. Following is a list of what I believe are some of the most fundamental principles of living organisms. Living beings and living systems are composed of patterns of relationships, not matter: All living beings and living systems (what I will collectively refer to as simply living organisms) consist of self-organizing and self-maintaining patterns of relationships and matter/energy flow—both between its own internal components and also between itself and other organisms and the environment in general. They all have semi-permeable boundaries, which conduct the constant exchange of matter and energy with the environment while maintaining its particular pattern. Even this pattern itself is in constant flux and flow, though it is far more consistent than the matter and energy that flow through it. Recall that the concept of a wave moving over a sea or a vortex standing above the drain in a draining bathtub helps us to conceptualize this idea that an organism is essentially made up of a particular pattern of relationships and matter/energy flow rather than the matter and energy itself. Living organisms are holistic: When it comes to living organisms, the whole is much greater than the sum of its parts. Studying the parts, no matter how much detail we gather, will never capture the qualities that emerge on the level of the whole—entirely new properties emerge on the level of the whole that are literally nonexistent within the simple sum of its parts. Organisms exist within a hierarchy of symbiotic holistic organization: One interesting feature of the property of holism is that we find the organism itself to be its own most fundamental unit. To understand this better, we can look at some of the most recent findings in the life sciences. The general consensus is that the nucleus-free (prokaryotic) bacterium is the simplest living organism that we have discovered. Any attempt to isolate its parts or reduce it any further will result in a lifeless mass—the matter still exists, but the qualities that give it “life” (discussed in more detail shortly) completely disappear. Going up the ladder of complexity, the evidence suggests that several different kinds of bacteria came together symbiotically to manifest as a nucleated (eukaryotic) unicellular organism. Continuing up the ladder still further, multiple unicellular organisms come together symbiotically to manifest as a single multicellular organism; going up the ladder further, we find ever more complex multicellular organisms—some kinds of protists, fungus, plants, animals and of course humans. Continuing up the ladder even further, we have ecosystems, which are composed of many different multicellular and unicellular organisms living together symbiotically, and which act very much like an organism in their own right. Finally, at the top of the ladder, at least on Earth, we have the entire biosphere consisting of all ecosystems and organisms on earth living together in a surprisingly cooperative and symbiotic manner. Again, the evidence suggests that the biosphere itself acts very much like an organism in its own right—the basis for the Gaia theory. So we find that life on Earth is composed of holistic symbiotic organisms, arranged hierarchically in terms of complexity, where symbiosis and cooperation are at least as important as competition and selfishness. Order and Chaos—the two faces of organic development: One particularly interesting feature of this hierarchy of organization is that the progression towards new levels of organization appears to occur in steps rather than along a continuum, from one order of organization to a state of relative chaos and disorder before finally emerging at an entirely new order of organization with entirely different qualities than that which existed previously. This new understanding of the development of living systems has intriguing implications with regard to our understanding of virtually every area of living systems, from intra-organismic development to evolutionary progression to social behavior to the so called mental disorders and psychosis to the process of regeneration and healing of all kinds. (1) Perception: Receiving input via sensory stimulation from the internal and external environment. (2) Interpretation/Evaluation: Interpreting what is perceived and making an evaluation with regard to its potential to either meet or interfere with one’s needs (i.e., is it potentially nourishing, harmful, or neutral?). One’s cognitive constructs are used to make this interpretation and evaluation. (3) Desire: The generation of an emotional and somatic response based on the assessment that occurred within the previous phase. While this likely manifests as relatively simple craving and aversion in simpler organisms, these evolve into a far more complex array of emotions, impulses and interoceptive sensations in more complex organisms (the word emotion comes the French word émouvoir, which means “to stir up”). Generally speaking, unpleasant emotions/feelings arise (with the general qualities of craving and/or aversion) when needs are not being met, and pleasant emotions/feelings arise when needs are being met. (4) Response: Taking action/responding in an attempt to meet one’s needs (i.e., attempting to take in nourishment and avoid or repel threats). 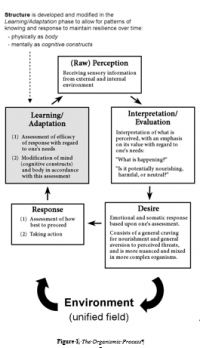 This phase has essentially two steps—an assessment of how best to respond (utilizing one’s cognitive constructs), followed by the actual response itself. (5) Learning/Adaptation: The main goal in this phase is to increase one’s future efficacy with regard to steps (1) through (4). This phase has essentially two steps—an assessment of the effectiveness of the response with regard to one’s needs, followed by the modification of one’s cognitive constructs and one’s physical structure in accordance with this assessment.
. . . and around and around this process goes, on each different organismic level—the more complex the organism, the more the levels. This process generally takes place so quickly and automatically that it is primarily unconscious. Humans and perhaps some of the other highly complex organisms clearly do have the capacity to slow down certain phases of this process, especially the assessment and response phases, which is likely one of the major benefits of self-consciousness and the associated physical structure (especially the highly developed prefrontal cortex). Whether the organism actually chooses to do this is another story. What is particularly important to recognize about the organismic process is that this process is the process of life—as long as life exists within a particular organism, this process of knowing, responding, becoming, knowing, responding, becoming . . . continues. It’s an all or nothing kind of a thing. Consider that even a single cell carries out the continuous repetition of this sequence of steps. Of course, its capacities with regard to each of the phases within this process are vastly simpler than those of an organism as complex as a human being. Generally speaking, as an organism becomes more complex and more resourced, the capacity for each phase of this process and the process as a whole becomes ever greater. What is particularly intriguing is that the evidence suggests we can even ascribe this same process to an entire social group (such as an ant colony, a flock of birds, a human family or society, an ecosystem, and even the entire biosphere—often referred to as Gaia within this context). It appears that there is something about this fundamental process of life that is simply invulnerable, so long as the particular organism remains alive. Another important implication of this idea is that all organisms conduct “real science” all the time—utilizing information that they take in from the world to shape their understanding and work towards ever more efficient strategies for meeting their needs. The emergence of cognitive constructs from the organismic process: Concurrent with the unfolding of the organismic process is the development of an organism’s cognitive constructs, the particular patterns of knowledge or understanding unique to each organism that are both directly shaped by the organismic process and also directly guide it. They are shaped most directly within the “Learning/Adaptation” phase of the process, and they provide guidance especially during the “Interpretation/Evaluation” and “Response” phases (more on the details of this later). Whereas the organismic process is, as the name suggests, a dynamic process, the cognitive constructs are more appropriately considered a kind of structure—they allow for particular patterns of understanding and responding to remain relatively resilient in the midst of this very dynamic process. Recall that the word cognition essentially means the act of acquiring knowledge or understanding. So cognitive constructs allow for exactly that—the maintenance of particular patterns of knowledge or understanding (which ultimately guide responding) via the formation of structure. Although there is essentially just one structure being formed in this process, we can say that it has two very different aspects: one aspect is that which is experienced subjectively by the organism, as occurring within what we often think of as the “mind”—a qualitative (non quantifiable) knowing; and the other aspect of this structure is that which takes place within what we often think of as the “body”—that aspect of the organism that can be quantified and perceived objectively. Even though these are both associated with the process of cognition, for the sake of simplicity, I will refer only to the mental (subjective) experience of these as cognitive constructs , while acknowledging that these always contain a corresponding counterpart manifesting in bodily form. To put this idea into context, let’s take the case of an amoeba who has recently arrived at the understanding that a particular element within its environment is toxic to it. This new understanding will manifest within this amoeba’s being as one structure with two different aspects—as the quality of subjective knowing itself (as occurring within mind), and as a bodily change corresponds with this (i.e., changes in the permeability of the cell’s wall or membrane, changes within the various components involved in its metabolism, etc.). This same kind of interdependent mind/body change occurs on many different organismic levels within more complex organisms. Consider, for example, the much more complex changes that occur within a human being upon recognizing the existence of an influenza virus in her or his environment. Subjectively, there would be the qualitative knowing that occurs on the mental level as the person integrates this new information; and objectively, there would be the physical changes that occur within the person’s body such as modified neural networks that go along with this new understanding or modifications taking place within the immune system upon coming into contact with the virus. Mind and body are simply two different perspectives of the same thing: So following from the discussion of cognitive constructs above, we can say that mind and body are actually not discrete entities at all, but rather are simply two different perspectives of the very same organismic process. Recall that the organismic process consists of the basic process itself as well as the structure (both mental and physical) that both emerge from this process and also continue to guide it in various ways. Mind, then, simply refers to the subjective experience of this entire process and its associated structure—in other words, what it all feels like from the “inside.” And body refers to that aspect of this process that can be observed objectively (as in “as an object”) and quantified. Recall that according to the positivistic worldview, with its emphasis on what can be objectively observed, the assumption has generally been that all human experience and indeed all life can be reduced to the body, with mind being nothing more than an often inconvenient epiphenomenon of the body. Notice how different the positivistic understanding is from the one being presented here, where mind and body are merely two different perspectives of the very same thing—the organismic process. While on the topic of mind and body, it’s important to take a moment to discuss the use of the term brain. In mainstream discourse, the term brain is often used to mean both the primary organ of the central nervous system (in those organisms that have one) and that which generates the mind (i.e., subjective experience). However, as we’ve been discussing, the reductionistic and materialistic assumptions inherent in this way of thinking have been shown to be highly incongruent with the developing research. Sure, there’s no problem with using the term brain to refer to the primary organ of the CNS, but it’s not appropriate to consider that the brain generates the mind or even that the brain is synonymous with the mind. The brain represents only one part of what is experienced within the mind. Recall that the mind refers to one’s subjective experience of the entire organismic process, including the entire physical structure (the entire body) and the intersubjective interaction between the organism and its environment. One final point here is that we can build off of this idea and recognize that all organisms (whether it be a bacterium, a human being, a flock of birds, or the entire biosphere) have both body and mind—again, body is simply that aspect of the organism that can be observed and quantified, and mind is that aspect that is experienced subjectively. Responsiveness as opposed to reactivity: It’s clear that the behavior of living organisms is very different from the behavior of nonliving matter. You only have to consider the difference between the knocking together of two billiard balls and the interaction between two unacquainted dogs to understand this important property of living beings. The billiard balls behave in a very predictable manner. But with the dogs, there will always be some degree of unpredictability with regard to how they will respond (and drawing from the chaos/order principle, in the case of the dogs, we will usually find that they interact in a more or less “chaotic” manner first before (hopefully) settling down to a more ordered pattern of behavior with each other). Network- and circular-causality as opposed to linear causality: Living organisms and living systems do not operate in a strictly linear cause and effect manner, but function within a complex web of network- and circular-causality. Very complex feedback loops and networks of mutual causality operate both within organisms and between organisms and the external environment, leading to conditions of vast complexity and fundamental uncertainty and unpredictability. These are conditions that positivistic inquiry is simply not equipped to adequately handle. From the methods of inquiry that have focused on direct subjective experience, we have arrived at an understanding of ourselves as arising from a profoundly interconnected and dynamic sea composed of the dance between unity and duality, which in turn gives rise to both unitive experience—what is often referred to as spiritual experience—and dualistic experience—our experience of a “self” as distinct from “other.” And this in turn gives rise to our most fundamental drive to maintain an enjoyable, healthy existence and the means with which to achieve this. …and from the fields that have emphasized objective observation, we find a very similar kind of understanding emerging. We see the growing recognition of much more holistic principles within the fabric of our universe: “Consciousness cannot be separated from matter, . . . the observer cannot be removed from what is observed, . . . [and quantum-actions are] information events that involve the interaction of parts of one interconnected, conscious universe” (Battista, 1996, pp. 203-4). And closely related to this is the emergence of a very similar kind of understanding with regard to the living organisms that have naturally unfolded from this fundamental fabric of the universe—seeing organisms as patterns of knowing/responding/becoming that unfold in a series of altogether new orders of organization with ever increasing complexity and symbiosis. So bringing these relatively objective and subjective perspectives together into one overarching paradigm, we arrive at a holistic organismic paradigm that is very similar to the one that has long been recognized by the nondual traditions of the East and most (if not all) indigenous societies: Life consists of an often mysterious blend of order and chaos, autonomy and symbiosis, mind and body taking place within a profoundly interdependent, interconnected relational field.